The ulnar nerve consists of multiple nerve roots, which exit the lower neck and join together after the brachial plexus (where the different nerves in your arms are formed). 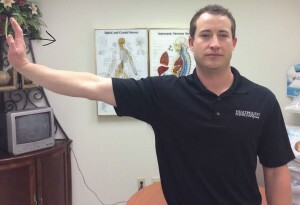 The nerve then extends down the arm, passes on the inner part of the elbow, and into the hand. 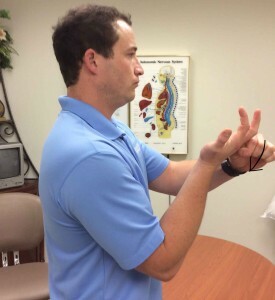 Any irritation of this nerve along that path can result in pain in the neck, shoulder, arm, and numbness/tingling in the ring and pinky fingers. This irritation can be caused by improper joint mechanics, muscle imbalances, and muscle/soft tissue adhesions. 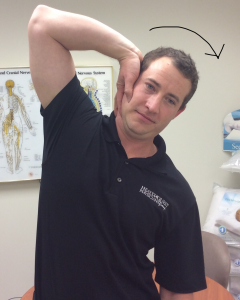 If the ulnar nerve is becoming irritated or “hung up” due to muscle or soft tissue adhesions. 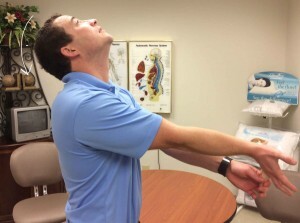 Nerve flossing exercises should be very beneficial. While performing this exercises, it is important not to overwork the nerve. There are a couple variations, I want to demonstrate. For the first variation, start with the elbow of the affected side bent. Grab the ring and pinky fingers and bend them backward. 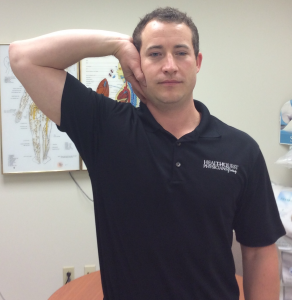 Once the arm is straight, bend your head forward slowly and hold for a couple seconds. Then bend your head backward slowly and hold for a couple seconds. Repeat slowly for 10 repetitions. 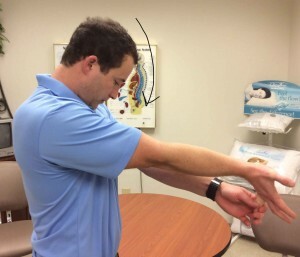 Start with the affected arm straight out to the side, then bend the wrist backward. 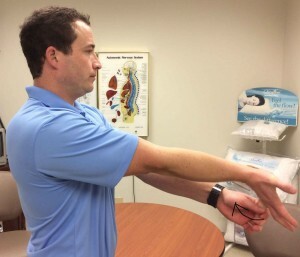 Keep the wrist bent and then bend the elbow and bring your arm back so the palm of your hand covers your ear while the neck is in a neutral position. Next bend the head away while keeping the palm in contact with the ear. Return the head back to neutral. Pause. Then bend the head away again. Repeat slowly for 10 repetitions. If this exercise does not improve symptoms, it is important to be evaluated by a professional to determine the cause of your symptoms. 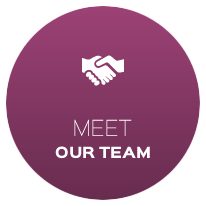 Chiropractic adjustments have proven to be a very effective treatment for correcting any improper joint mechanics, muscle imbalances, and helping to free up the ulnar nerve to improve symptoms. If you are experiencing any numbness or tingling in the fingers, or pain in the neck or arms, or know someone who is, please share this information with them and contact me with any questions, concerns, or stop by the office for an evaluation!